A Bridging Visa A normally has the same conditions as the previous visa, and in some cases like when you’ve applied for an onshore Partner Visa (Subclass 820), they will give work and study rights on the Bridging Visa A. But one thing they will NOT do is to allow the bridging visa holder to travel! Need to be very aware of this. Bridging Visa A’s do not allow travel! What happens if you travel on a BVA? You may leave Australia on a Bridging Visa A. The problem? You may not come back! 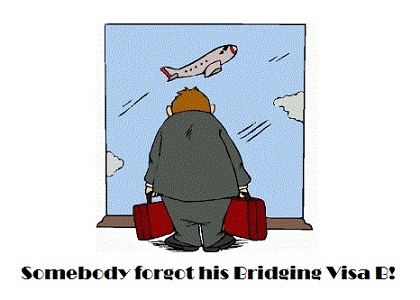 We had somebody the other day whom we stopped from traveling on a Bridging Visa A. We had explained previously, but she thought it didn’t matter and that she could get a tourist visa back to Australia after her visit. No, sadly not at all. I had an awful situation a number of years ago. Applicant who was in a long-standing de facto relationship with an Australian man, and had applied inside Australia for a partner visa. They had settled in nicely together, however the problem was that she had not included her little boy. He was back in the Philippines. Well, little boys being little boys, he decides to fall from a great height and end up in hospital. Mum rushes onto the next plane, as mums will also be mums. So she ends up outside of Australia on a Bridging Visa A. We apply for a tourist visa for her to return. What do they do? They refuse it! Why? Because she has no intention of returning. That’s how the Regulations work. And before anyone panics about this, yes tourist visa holders may apply for further visa applications inside Australia. They may even apply for partner visa applications whilst inside Australia, as long as that isn’t the primary reason for going to Australia. This poor lady had no other reason to go to Australia other than to wait for them to process and grant her partner visa application, which they couldn’t do while she was outside Australia. Tried again. Failed again. The ended up refusing the partner visa because of this! So do NOT travel on a Bridging Visa A! What do you do? You ask that most skilled of Registered Migration Agents Jeff Harvie to apply for a Bridging Visa B for you, based on your intended travels. And you do this within 3 – 4 weeks of your intended travels. This will allow you to enter and leave as many times as you want, all within a specified time period. In fact, the Bridging Visa B takes the place of your Bridging Visa A, and will be with you until they make the final decision on your substantive visa application (eg partner visa application, or whatever you’ve applied for). And it will allow the BVB holder to leave Australia, and to freely return again during the travel period. What is this “travel period” of which I speak? Well, you need a reason for a Bridging Visa B. Whilst it’s not something you need to stress over, it’s still a visa application, and as such they can refuse it if they have a good reason to. You can’t apply for one and say “Well, I wanted to have one just in case I needed it”. That would meet with a refusal. You have a Bridging Visa A because you want to be in Australia, because you applied for the main visa ALSO because you wanted to be in Australia. It’s actually a privilege that they gave you the Bridging Visa A in the first place. It’s a bit like sticking your hand up in the classroom to ask the teacher permission to leave the room. So take the application seriously. So, if you apply for a Bridging Visa B to attend your sister’s wedding in November, and you would like hubbie to join you to celebrate New Years with your parents, then this is what you put on the application. You say you wish to leave on 15 November, and return on 10 January. The visa grant will come back probably saying you have between 1 November and 1 March to travel. So you may only travel in those timeslots. Don’t try to come back on 2 March, or you will be in for a rude shock. What if you want to travel again in May because your son is graduating Elementary School? You apply later for another Bridging Visa B, and you will get something similar. So, that’s how it works. Take it seriously. Never assume. Things can go horribly wrong if you mess this one up. No travel on Bridging Visa A’s. And by the way, if you have a Bridging Visa C then you can’t apply for a BVB at all. You need to stay put. I am currently on a student visa and will apply for a Temporary Graduate Visa (485) when I graduate. If I am successfully granted a Bridging Visa B and am overseas whilst my 485 application is being processed, do I have to be in Australia when my application is successful or will it become invalid if I am still overseas at the time of the outcome? Many thanks for your help. Your website has been very informative. Glad you like the website, Benjamin. But I only do partner and tourist visas. I don’t handle student visas or graduate visas, sorry. Thanks for this clear and very useful website! Awesome work! I just wanted to know if I need a BVB for each time I want to leave the country, or if I can travel as many times as I like (and precise in the application) during the allowed “travel period”.? I know nothing about your circumstance, Thomas. I can’t comment. Hello, I applied for a BVB without any supporting documentation as I have not bought my tickets home for concern of not having the BVB approved. I only stated “annual leave – visiting immediate family and friends, attending an uncle’s wedding” as a reason for travel. Would this be an issue? Also, would the refusal of a BVB affect my future visa application(s)? I can’t tell you if they’ll be happy with that or not, Tiffanie. And unless you lied on the application, I can’t see a refusal being an issue. Hi. Im currently on a BVA. Im in Australia. I applied for a BVB in February. Just short of 3 months before I intend to travel to UK.. for 7 weeks. I expalined my parents were 88 and that my Father is sick. I havent heard anything yet and I leave in four weeks. Im getting worried!!! Ive been trying that. ” youre currently 74th in the queue” etc etc. Not to mention the fact that the majority of people you speak to actually dont have a clue what theyre talking about. Yes, that’s life. But if you want to find out, it’s the only way. Excellent information that ui wish i would have come across earlier. My partner had tourist visa and we were in the process of putting in our partner visa application that we realised that he had overstayed his 3 month travel by 11 days !!!! we rushed to put in our partnership application within a week. After much conversation with the department he was granted bridging visa C. He is a consultant and needs to work globally and is now worried sick about the next time he needs to travel. Can you please advise what the options are? He will not get a Bridging Visa B whilst on a Bridging Visa C.
My partner has been granted a BVA for our partnership visa, however, in 4 days her tourist visa expires which then allows her BVA to take place. We’re looking at flying to her home to visit her family to introduce our baby to extended family at the end of the month. My question is, there is no where on the Immi account to apply for a BVB, is this a visa we just apply for through post? Definitely there on the Immi Account, Ben. Look again. I have partner visa 801 in process and it’s being looked at as we speak. We are very hopeful it’s going to get granted. But just in case if doesn’t what Visa would I go on then ? As I will be overseas at the time of decision? If it isn’t granted you will go onto no visa at all, Jennifer. The Subclass 820 will finish if that happens. I hope you did your paperwork for the 801 finalisation properly. I informed my immigration agent I wanted to travel back to Philippines on November to visit my sick mom. I bought a ticket for November but emergency occurred and learned my mother is in critical condition so I asked my agent I will rebook immediately my ticket and what would be the best possible time ,she advised me to rebook it for 1 week before requesting for the BVB and give her the photo of my ticket so she can submit it when she lodge my BVB. I gave her the copy of my ticket dated sept 25 flight. She lodge my application Sept.13 though she even told to me you can rebook sept 20 and it will be okay before your flight. I gave allowance and got sept.25 ticket but tomorrow is already schedule of my flight and I still don’t have visa. Is there any contact no I can ask what will be my status because I’m I’m worried and need to rebook again and feeling worried of my moms condition. I asked my agent but she told me rebook your ticket again, we are still waiting and she doesn’t know whom to call to follow up. You can call the main Immigration line which is 131881. Do not travel without the BVB being granted! Im holding a tourist visa 600, single entry. Originally, the plan was to visit my fiance but when he found out that I got my visa approved. He wants us to get married there. Part of my itinerary is I will be staying for 1.5 months in australia, end Nov, and next year, Feb. i will be flying to new zealand n stay for a month. If were married on dec, is it possible if I could apply BVB before going to New zealand? No. (a) If you apply for a partner visa, when the current tourist visa expires you will be granted a Bridging Visa A, and (b) if you want to travel you need to apply for a Bridging Visa B. You don’t just suddenly apply for a Bridging Visa B because you married. You will mess up everything if you try to do this. Hello! Thanks for your information regarding BVB. I am under sc600 and on nov 25, 2018 my BVA will take effect under 189 de facto pr application. I would like to come home to Philippines to celebrate the holidays which i know i have to apply for BVB. My question is, will it affect the processing of our PR application? My partner will not be coming with me as she is employed. Some people say it will make the application process longer, will it? Many thanks, Jeff! I have no experience with 189 visas, so I’m not the one to ask. My bridging visa B while outside of Australia. I applied for a visitor visa which was granted and I am now back in Australia. How do I get my bridging visa A back? My bridging visa B while outside of Australia. <-- Your bridging visa B what outside of Australia? Are you saying that you overstayed a Bridging Visa B? Suggest you use the contact form and explain to me what happened. This isn't really the right place. Thanks for all the above information. I submitted my husbands bvb online 2 days ago. He Is currently on a bva. I attached his passport and a cover note from my husband stating he wants to see his family whom he hasn’t seen since arriving in Australia 2 years ago and that he would like to introduce his new baby to his family. I’m worried this may not be a substantial reason for approval. Also how long do they usually take to get back to you with an answer from your experience? Thanks in advance. Usually processed in about a week. We advise 3 to 4 weeks before travel dates. You would retain the Bridging Visa A, yes. There is no risk in applying. You will need to wait for the visitor visa to expire before the bridging visa comes into effect. We forgot to check the date of the last Bridge Visa B granted. I had travelled back to Aus three weeks earlier due to family emergency. Now, we had realised that my fiance’s Bridge B visa had expired for a little over a month. Is apply for tourist class 600 Visa the best way to get back? We were just careless to had forgotten about this issue. we had already applied? Thank you. You can try, but no guarantee of success. That’s why you need to take dates on visa grants very seriously. If you do manage to get back on a tourist visa, you will have to re-apply for a Bridging Visa A.
I am on BVA for Partner Visa and I will file a BVB for our holiday next month. I am planning to submit a copy of our ticket and passport. Is that enough? I also stated in the reason as holiday and my mum’s birthday/retirement party. I won’t tell you how to submit an application or tell you if something is sufficient, sorry. I am currently having an issue with my BVB which due is 12 Jan 2019(yesterday)coming from Philippines to visit my family and kids. My ticket going back to Australia should arrive 5:35am of 12 Jan which is just supposed to be alright, but my flight from Manila to Macau (connecting flight) was delayed and arrived in Macau late that results to not catching my 2nd flight to KL and from KL-Perth. The airline and the broker rebooked me the earliest flight to Perth but it is 20 minutes late for my due which will arrive in Perth 12:20 of 13 Jan 2019. And due to the delayed flights which clearly wasn’t my fault, i was not able to board going to Perth because when i was checking in to get my boarding pass they said they cannot let me board the flight because of the visa validity which is just 20 min late when arrived in Australia. This situation resulted me to be stocked now here in Kuala Lumpur as i didn’t get help since the embassy here is closed and will be open tomorrow Monday 14 of Jan. I’m currently have a partners visa lodged last July 2017 in Australia and just waiting for the T.R. What is the best visa i can apply to re-enter Australia? or the right department in the immigration to seek advice of what had happened while on my way to Australia. Please, your response will greatly appreciated. If you overstay on a BVB, it ends. You no longer have any bridging visa at all, and you don’t have a right to enter Australia again. Your only option is to try to get a tourist visa back to Australia, and to apply again for a Bridging Visa A.
I’m currently holding Bridging Visa A for my PR Visa process (visa 187-RSMS). I have a plan to visit my family living in Germany on June-July 2019. So I’m going to apply for Bridging Visa B (BVB). However, there is a requirement of Schengen Visa about “Proof of Visa status in Australia” which requires my Australian visa must be valid for multiple entries to Australia until at least 3 months after my departure from the Schengen area. However, Australian Immigration department normally grant only 3 months of validity / multiple entries for Bridging Visa B (BVB), it means that at the time I complete my trip and leave Schengen area, my BVB will have less than 3 months of validity / multiple entries. Therefore, do you know if I can apply for Bridging Visa B with more than 3 months of validity / multiple entries ? I’ve had no experience with Schengen visas, sorry Tom. Better you ask advice of someone who does. I have applied for BVB visa and submitted my application by post. It has been four weeks. But still I did not get any reply. Even they didn’t deduct the money yet. How can I contact them to get reply earlier? It’s always slow when you lodge it by post. It’s probably in a big pile there waiting to be picked up. There is no reliable way of chasing it up, sorry. Can we apply BVB visa online. If yes, what is the procedure to apply please? If you want to apply for it yourself, please go to the IMMI Account and you will see a link. Please don’t ask us to guide you in doing your own applications.